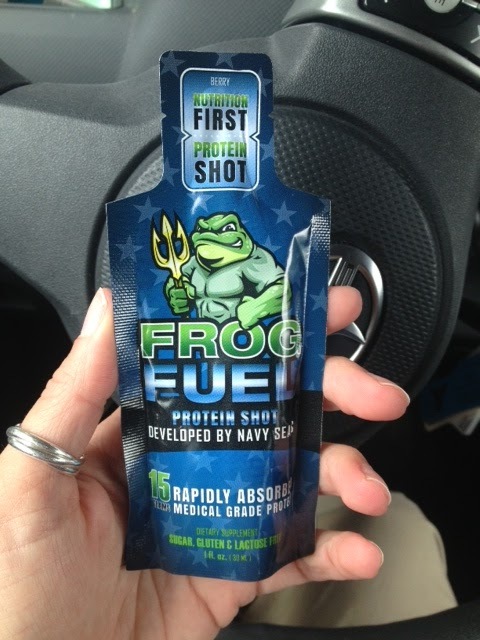 DoubleD Athlete: Protein in a NEW way: Frog Fuel Review and GIVE AWAY!! Protein in a NEW way: Frog Fuel Review and GIVE AWAY!! I seem to have some sort of stomach issue with protein powders. I have discovered I can do Whey Protein Isolate but not just Whey Protein. I had a company contact me about a review of their Protein gels, Frog Fuel. I have to say when I hear protein I get a little nervous due to my stomach issues but I saw this was Collagen Protein so I figured I'd give it a whirl. Ever had Collagen Protein? I have had Vietnamese soups with tendons and collagen and to be honest you can tell right away. Your lips feel better instantly! It is the naturally occurring protein in your body that is a part of connective tissue and muscle. So I figured my stomach would be happy with this one. The other thing that scares me is gels, I can be pretty particular about consistency in gels. I am not a fan of the ones that feel like frosting in your mouth. Thin but not runny is usually best for me. And I'm sorry did you say protein and CAFFEINE. I am a firm believer in caffeine helps performance. All my gels and chews for racing are caffeine laden. I went to the gym to get in my typical workout and I figured I'd give it a try. I have to say the consistency of the gel was thin but not runny. It had a slight after taste but I think that was the taurine, kinda like a Red Bull. 15g of protein and no heavy digestion feeling. The berry flavor was pretty good, not super strong. I have to say I very quickly felt the boost from the taurine, a little kick in the pants! Generally when I reach for protein for workouts it is thru food, bars or protein shakes. It was nice to have an option that I could just throw in my bag and not have to pre plan the food and logistics that go with protein with workouts. I threw it in my gym bag just like my other gels are usually in there. I have to be honest I was bummed I only had 3 to try, I liked them a lot. 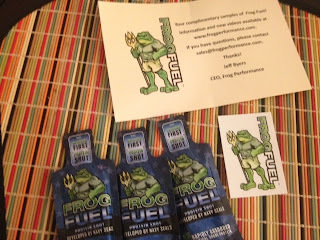 The folks at Frog Fuel have offered a nice little give away for you lovely readers- your own 3 shots of Frog Fuel and elite sticker. So comment below on your use of protein for your workouts. For an additional entry tweet me @doubledathlete with your fitness/protein tips with #frogfuel. I will draw a winner on 1 Aug.